ILGWU labor organizer Min Matheson, circa 1975. In the 1920s and 1930s, as the bottom was falling out of the anthracite industry, apparel manufacturers moved from New York City to northeastern Pennsylvania. Owners of garment factories looked to employ, cheaply, the women and girls of the Wyoming Valley. Min Matheson and the International Ladies' Garment Workers Union (ILGWU) called the operations "runaways," that tried "to get away from the New York [union] agreement" and the higher wages afforded workers by collective bargaining. Min and her husband Bill moved to Kingston, Luzerne County in 1944, she as the ILGWU's General Manager of the Wyoming Valley District and he as Director of Education for eastern Pennsylvania. Conditions were horrible for the wives and daughters of many unemployed mine workers. Employers ignored labor laws on the books and pressured the women to work two, even three shifts. Min recalled in an interview how operators exploited the workers from the start: "They told the women, '...We'll teach you how to sew.' They worked for weeks for nothing. And the hours!" Min arrived to find six organized shops with 650 union members. When she left in 1963, there were 168 organized factories and 11,000 ILGWU members. Success came quickly in Wilkes-Barre, Kingston and Nanticoke, but at Pittston, Min faced difficulty and threats from organized crime. Crime bosses used garment factories as fronts for other, illegal activities, and used local police forces to keep out the union. Min and union workers faced harassment and intimidation from both. Personal charisma added to Min's leadership and her ability to get national media attention and the media attention helped keep her and striking garment workers from harm. She promoted the legitimacy of the union through grass-roots support and the skills of the female garment workers themselves. She forged a coalition that raised awareness of and drew loyalty from the entire community. As more shops joined the ILGWU, the union also contributed to families' non-working lives with activities that included a morale-boosting chorus, a college scholarship fund, evening classes at Wilkes College, a health center, and death and maternity benefits. "The union became a community of sorts," write authors Ken and Robert Wolensky, "an educator, social center, advocate and protector, and a source of some security in an uncertain world." Women's work in the garment factories was an important source of family income, sometimes the only source, in the 1950s and 1960s. To men who had always supported their families, this dependence caused feelings of embarrassment and uselessness. But the boom in garment work was short-lived; owners moved the factories again to areas where cheaper labor could be found. 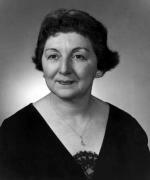 In 1966, Min Matheson became one of the founding members of the National Organization for Women (NOW). She died in 1992. Kenneth Wolensky Nicole Wolensky and Robert Wolensky, Fighting for the Union Label: The Women's Garment Industry and the ILGWU in Pennsylvania (University Park, PA: Penn State Press), 2002. Robert P. Wolensky and Kenneth C. Wolensky, "Min Matheson and the ILGWU in the Northern Anthracite Region," Pennsylvania History (October, 1993): 455-474. Robert P. Wolensky and Kenneth C. Wolensky, "Born to Organize," Pennsylvania Heritage (Summer, 1999): 32-39.